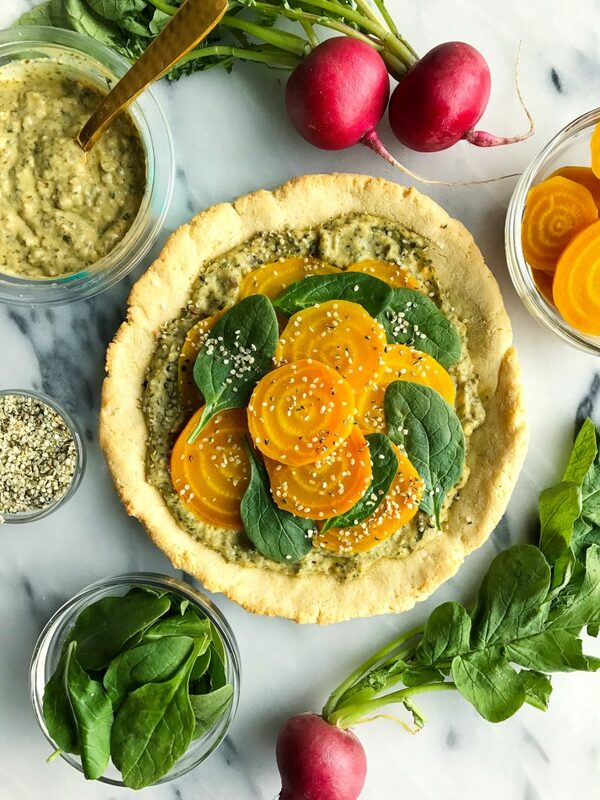 Spring Veggie Pizza with Almond Flour Crust made with just 4 ingredients! Yup, a grain and dairy-free pizza crust is happening and it is made with just four simple ingredients. AND it is ready in literally 15 minutes. And the best part? The DREAMY toppings. 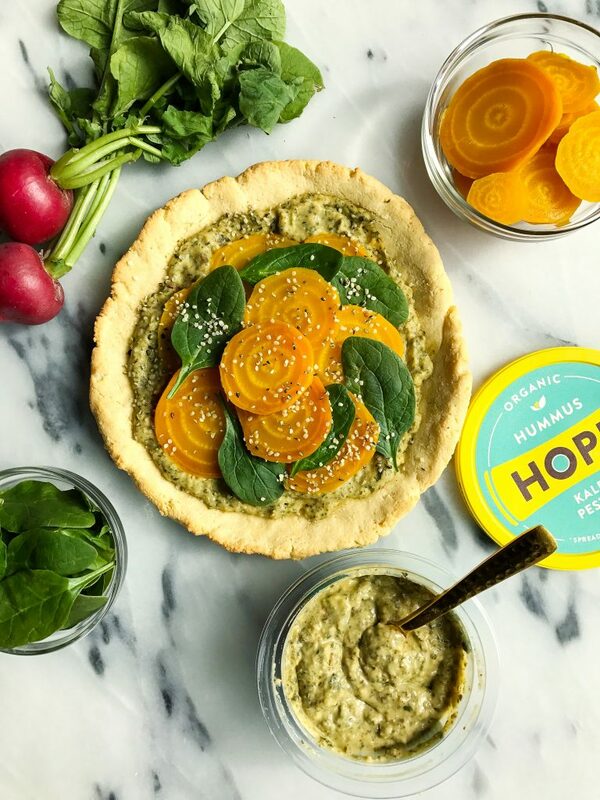 We are talking spring veggies and my absolute favorite Kale Pesto from Hope Foods. If you have been in my apartment when this pesto is in my fridge, it is likely that you have seen me spooning it right of the container most days. But I figured making a delicious recipe with it would be a bit more to your liking then my spoon-fest. When I shared those Almond Joy Brownies, I spoke about my love affair with Hope Foods and all of their products. Everything from their original hummus to dark chocolate hummus and spicy avocado is all just amazing. I love keeping a variety of their products in the fridge because they can be used in a variety of ways. I love adding their spreads on top of my bagels, toast, crackers and even pasta. The kale pesto hummus plus your favorite pasta with a little grilled chicken or turkey meatballs – oh my gosh, to die for! The pesto also is the cherry on top of this almond flour pizza crust. This whole dinner was ready in 15 minutes, which is amazing because who has time to make a gourmet pesto sauce after you get home from work plus do everything else? Always need to keep this on hand. 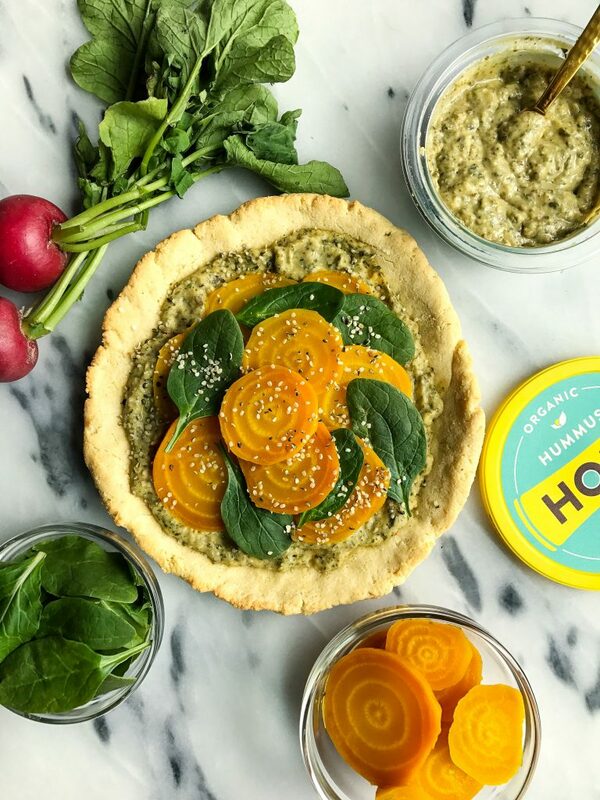 And while you wait for the pizza to cook, dip some veggies in Hope Foods Kale Pesto and you won’t be disappointed. This pizza crust has been my go-to a handful of times already since making it and I have a feeling it will be yours now. ANY more toppings you wish! Get creative with the toppings! This Hope Foods Kale Pesto goes amazingly well with cheese, chicken sausage, anything! 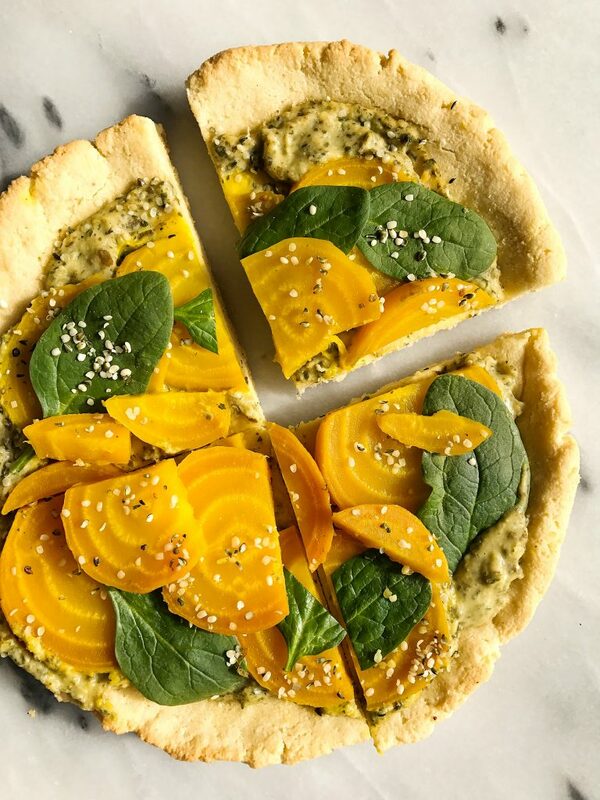 Top with golden beets and spinach, slice and enjoy! Thank you Hope Foods for sponsoring this post. It means so much to me to work with brands that I love and who support rachLmansfield! This looks incredible! Ah the golden beets make me so excited for farmer’s market veggies! Hope Foods is my favorite brand of hummus!! In love with this pizza! This sounds amazing! Do you think I could make the crusts ahead of time on say a Sunday, and then take them to work with me for the week? I’m trying to find new things for lunch at work and this seems so fun! Tried and tested! So yum! Will definitely make again! The only tip I would give to others is to wet with a little bit of water whatever it is you are using to roll out the dough. It can be a bit sticky, but the little bit of water fights the stickiness effortlessly. We topped ours with some high quality pizza sauce, uncured pepperoni, and a TON of organic mozzarella cheese! Thanks for sharing, Rachel!